Holganix Bio 800+ is an organic plant probiotic that harness the power of over 800 species of soil microbes to optimize soils and grow healthier, more sustainable plants. But, there are a lot of ways Holganix grows healthier turf and plants! Here are our top seven favorite ways Holganix Bio 800+ GROWS healthier turf and plants. 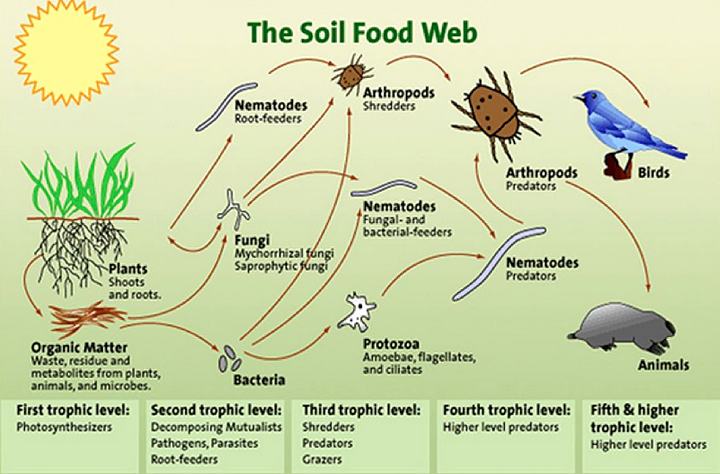 When the soil food web is in balance, soil microbes go to work breaking down nutrients within the soil, fortifying plant health and stimulating plant growth. The soil microbes in Holganix Bio 800+ increase the diversity and population counts within the soil food web. If a certain segment or species within the soil food web is weak, adding microbes from Holganix Bio 800+ will help strengthen that segment. Houses have foundations that support the entire structure. Plants and turf do too! The roots act as the foundation that supports a healthier overall plant. When your plants have strong root systems, they are better able to withstand environmental stresses from disease, insects, traffic and weather. A stronger root system with long roots is also able to more effectively mine for nutrients, minerals and moisture within the soil. Are users seeing good rooting with Holganix Bio 800+? Most of our customers see a considerable improvement in rooting. Check out the roots submitted on social media above to see some of results. When using Holganix Bio 800+, you increase the effectiveness of synthetic inputs like fertilizers and pesticides, allowing you to reduce inputs. That means when you use Holganix Bio 800+, you’re using a greener product that differentiates you from your competitors. How much can you reduce your inputs? Check out our compatibility list here for rate reductions and recommended components to use with Holganix Bio 800+. When your plants need less water, you can cut back on irrigation and help survive tough weather conditions like droughts and summer heat. Holganix Bio 800+ isn’t a drought cure-all, but it can help your plants go into dormancy later and come out of dormancy stronger! One of our favorite stories regarding water reduction is Ed Smith Stadium, the spring training field for the Baltimore Orioles. Check out their story here. Because Holganix Bio 800+ builds stronger roots, your plants are better able to defend against environmental stresses and more easily recover when attacked by disease, insects and weather. Holganix Bio 800+ also contains microbes that eat pathogenic microbes and release antibiotics in the soil that defend the plant from harm. Check out Manada Golf Course in PA, then read their case study here. Thinking about doing a little overseeding? Holganix Bio 800+ can help with that! 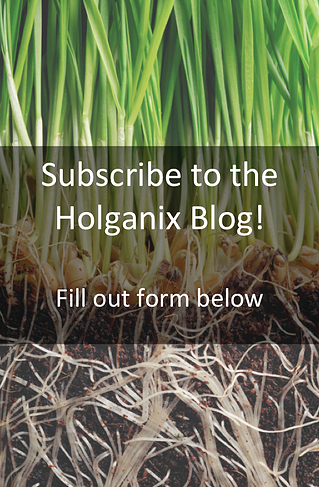 Customers that apply HolganixBio 800+ during seeding see an increase in seed germination rates. Can you guess which pot was treated with Holganix Bio 800+? This test was conducted by Sam Whitehouse of Whitehouse Lawn and Landscape in PA.
Holganix Bio 800+ reduces transplant shock by mending a disrupted soil food web, making the plant’s new environment a happy and healthy one! It also builds strong roots so the new plant can better “root” into its new home. And because of specific soil microbes contained in the product, Holganix Bio 800+ increases stress tolerance so your plant is better able to handle the stress of moving into its new home. Learn more about the seven ways Holganix Bio 800+ grows healthy plants by watching our webinar featuring Holganix’s Director of Plant and Soil Science, Dr. Neidermyer. Then, download our soil food web ebook to learn about the importance of soil health. Whether you are a lawn care company owner looking to add an additional revenue source or a golf course superintendent looking to boost the look of your course, taking care of flowers should be one of your priorities. How can Holganix Bloom help? Holganix Bloom (a Bio 800+ product) is a 100% organic plant probiotic infused with over 800 species of beneficial microorganisms, microbe food and nutrient enhancers that build healthy soils and healthy plants. With Holganix Bloom, you can reduce the use of fertilizers and pesticides by up to 75% while promoting vigor, life and color of your blooms. Ingredients in Holganix Bloom such as plant growth-promoting bacteria stimulate plant growth and increased nutrient efficiency. Ingredients in Holganix Bloom foster resilient plants that are better equipped when faced with stresses from disease and weather. For example, when flowers are faced with severe heat, mycorrhizae fungi contained in Holganix Bloom help flowers better retain moisture and build dense, healthy root systems. Additional ingredients such as yucca extract and sugars assist with water retention. If your flowers are facing disease problems, ingredients such as trichoderma fungi, mycorrhizae fungi and beneficial nematodes help naturally build the plant’s immune system and combat disease. Flower installs can be a huge stressor for plants and can lead to revenue loss due to plant loss. Ingredients such as mycorrhizae and lignin polymers among others, help break down potting media and nurture healthy roots that will more easily adapt to new habitats. 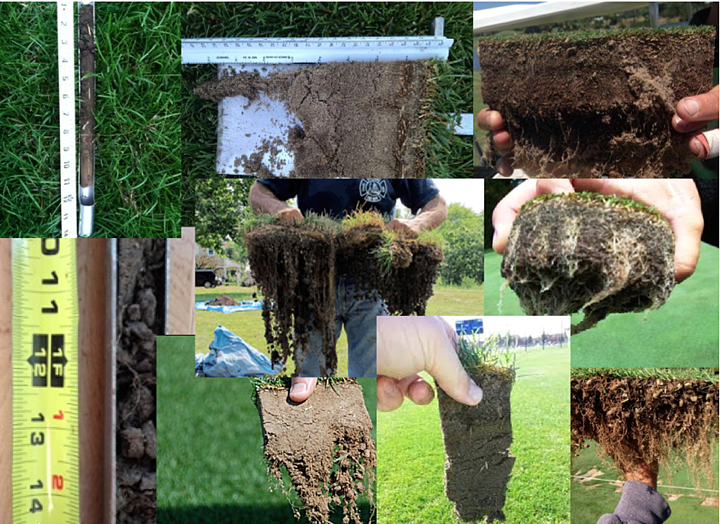 At Holganix, we are self-appointed soil geeks. Learning about new trends, research and theories that are happening in the field make us tick. We bet it gets you excited too! Here are our top 5 favorite articles on soil microbes (to be fair, some are videos). Scientific American explores research from Virginia to Colombia that has been conducted on microbes to boost plant health and crop yield. “Microbes act as sentinels of food safety and furnish an environmentally sound alternative to massive inputs of fertilizers and pesticides,” says Scientific American. Consider this short read the "Bible of Soil Science". 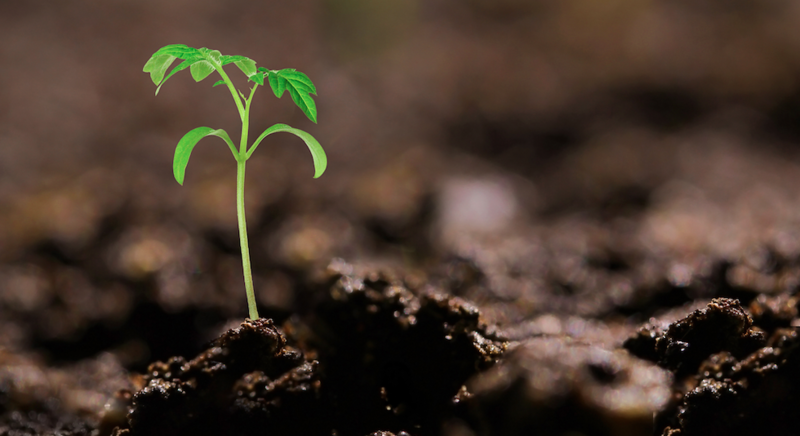 Written by Dr. Elaine Ingham – the godmother of the soil food web, in partnership with the USDA, The Soil Biology Primer introduces soil health and soil biology and how it contributes to agricultural productivity and environmental sustainability. If you pick up a handful of soil, you will be holding more microorganisms in your hand than the entire number of people who have ever lived on earth. Think about that for a moment. Can you imagine the quantity of living things in your grasp? The soil is FULL of life. In this TED Talk, you’ll have the opportunity to explore the soil from the microorganisms’ point of view. While not an article, this TV series from the History Channel digs into fertilizer. From synthetic N-P-K to sewage-based solutions to vermicomposting and compost, Modern Marvels provides both an entertaining and factual documentary on fertilizer and the history of growing plants. Hint: If you don’t have a subscription, you can stream the video online for $1.99 on Amazon. Winter is Coming! Are YOUR Turf & Plants Ready? Are your turf and plants REALLY ready for winter? Once winter hits, your turf and plants will be under a lot of stress to survive the season. Don’t let Jack Frost put your turf on ICE! Increase plant hardiness to better survive winter injury and recover in the spring. Combining Holganix refrigerated liquid products with Holganix 2-10-20 for fall applications to turf and plants enhances plant hardiness. Holganix 2-10-20 is our newest product and is a phosphorus and potassium-focused fertilizer that contains biological food sources. How do Holganix & Holganix 2-10-20 increase plant hardiness? 1. Increases stress and cold tolerance by building strong roots. Ingredients in Holganix refrigerated liquid products, like endo and ecto mycorrhizae and trichoderma fungi as well as the phosphorus and potassium found in Holganix 2-10-20, promote healthy root growth. Promoting a thick, web-like root system can prevent roots from ripping when soil movement shifts as temperatures melt and freeze soil moisture. Having deep roots can also help plants mine for moisture. As soils freeze, plants can literally die of thirst. Potassium also positively regulates water levels within the plant, preventing unnecessary water loss. The nutrients contained in Holganix 2-20-20 are maximized through Armament Technology contained in 2-10-20 and Holganix refrigerated liquid products. Both work to increase uptake of nutrients by the plant. Holganix contributes to a balanced soil ecosystem that builds strong plants. A stronger plant will have the resilience to survive winter and bounce back from weather stress when spring arrives. For example, Nitrogen Fixing and Phosphorus Solubilizing Bacteria in Holganix refrigerated liquid products go to work when temperatures warm up and unlock nutrients, giving your plants a boost of energy to recover from winter injury. They also help unlock nutrients before soil temperatures drop below freezing to help the plant hibernate through winter. Holganix 2-10-20 is a liquid potassium and phosphorus-focused fertilizer containing biological food sources that BOOST plant growth. When combined with Holganix refrigerated liquid products, results from Holganix 2-10-20 are enhanced! Visit our Holganix 2-10-20 product page on the website here and then attend Holganix's upcoming webinar: Are Your Turf and Plants REALLY Ready for Winter? “We’ve tried some similar products to Holganix, but they’ve never really responded or stayed in the market long,” explains Denny Bengert, owner of Bengert Greenhouses. 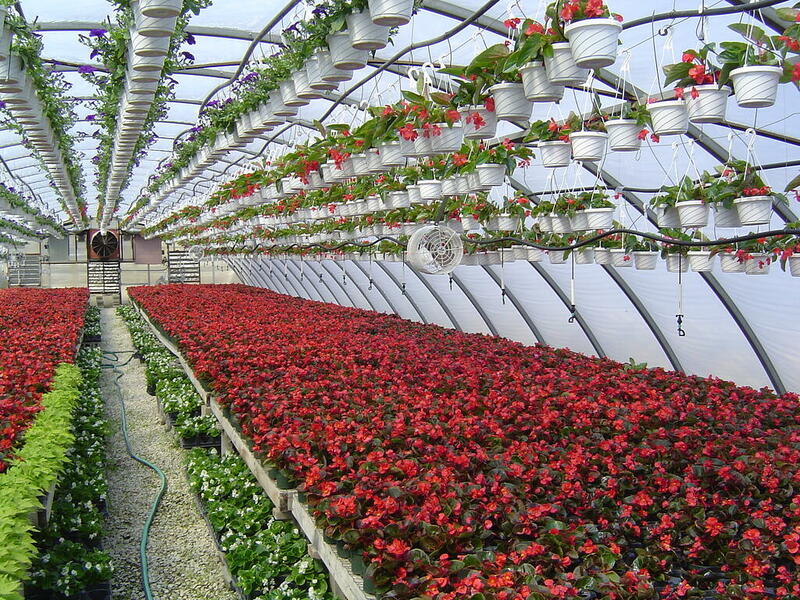 Bengert Greenhouses features 60,000 square feet of greenhouse space used to grow flowers. Denny typically sells plants wholesale and retail with a focus on delivering to organizations like churches. 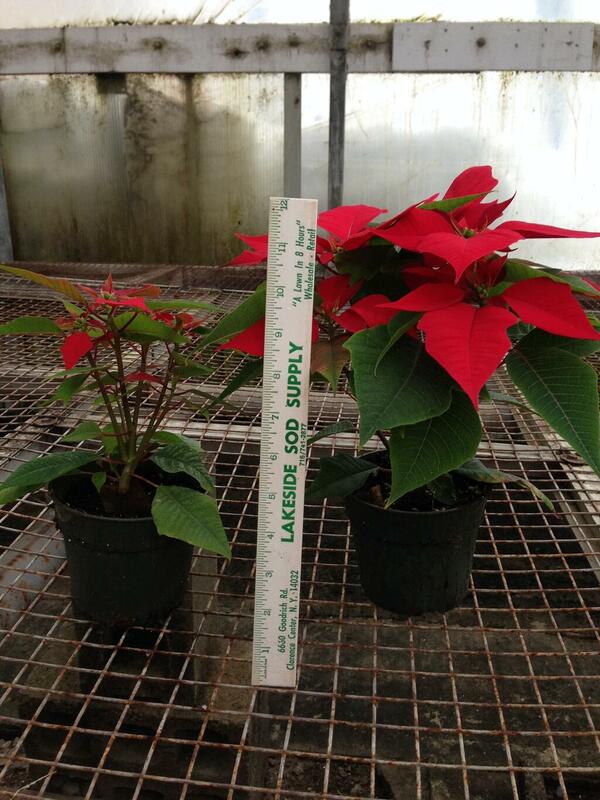 Denny has been using Holganix Bloom as a compliment to his fertilizer program on poinsettias. “Bloom makes the fertilizer work better,” explains Denny. “That’s why we can use less of it.” So far, Denny has decreased nitrogen fertilizers by 10-15%. Now that he feels comfortable with the product, he plans to further explore nitrogen reductions. Left plant treated with Denny's usual program, right treated with Holganix. Please note that the ruler is propped up against the plant and that the reading is skewed. “One of the big things we’ve noticed is that we’ve used less fungicides with Bloom. In fact, we’ve used less fungicides than ever before.” So far, Denny has cut fungicides by 30%. 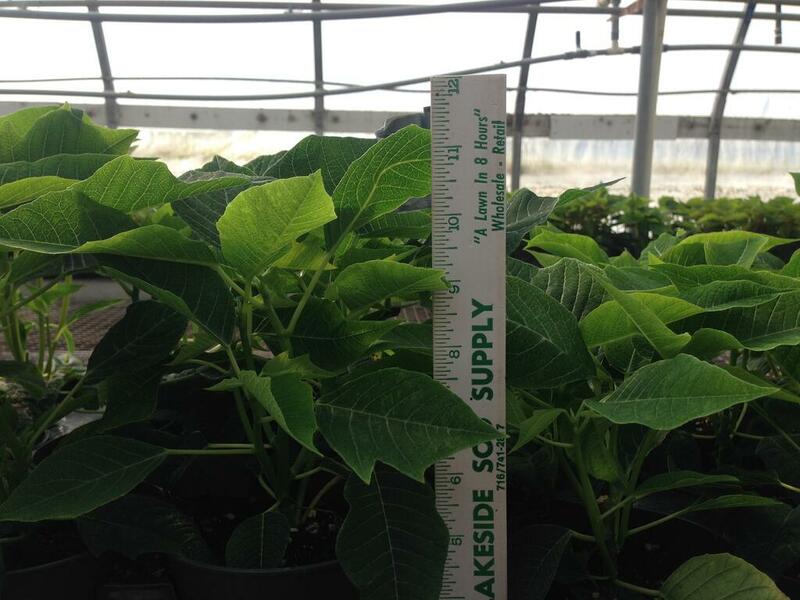 Keep in mind, that poinsettias require heavy doses of preventative fungicides because of their tricky growing season which features shortened growing days in the fall and winter. According to Denny, part of the reason why he can use fewer fungicides is due to root development. “We monitored root development heavily,” explains Denny. Poinsettias are prone to root disease, especially early in the plant’s development. 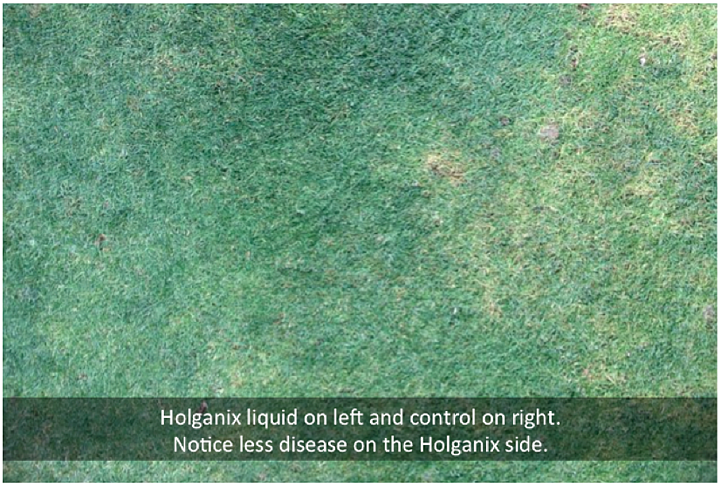 How can Holganix Bloom help you reduce the need for fungicides? Holganix Bloom builds functioning soils that result in resilient turf with deeper, thicker root systems. In fact, by having more resilient plants with a better root system, these plants are better able deal with the stresses caused by disease. The result is that you can often reduce the need for certain fungicides. At the end of the day, Holganix Bloom has improved the developmental state of the plant. That means the plant both matures earlier and stays in peak conditions longer. Holganix Case Studies: Does Muirfield Village Use Holganix? At 6 foot 3 inches, bright blue eyes and a mop of unruly brown hair, Muirfield Village Golf Club’s Horticulturist, Tim Hollowell CGCS, was exactly as I expected, the inquisitive and passionate scientist. As I sat down with him and Holganix inventor and scientist, Stephen T. Lange, at the 2014 Bionutritional Summit, I’m again reminded that I’m a novice in plant science. The two threw around “big” plant terms that have me reeling, but at the end of the day it’s clear Tim is excited with the results he’s seeing on his plants with Holganix. What was Tim's first impression of Holganix products? 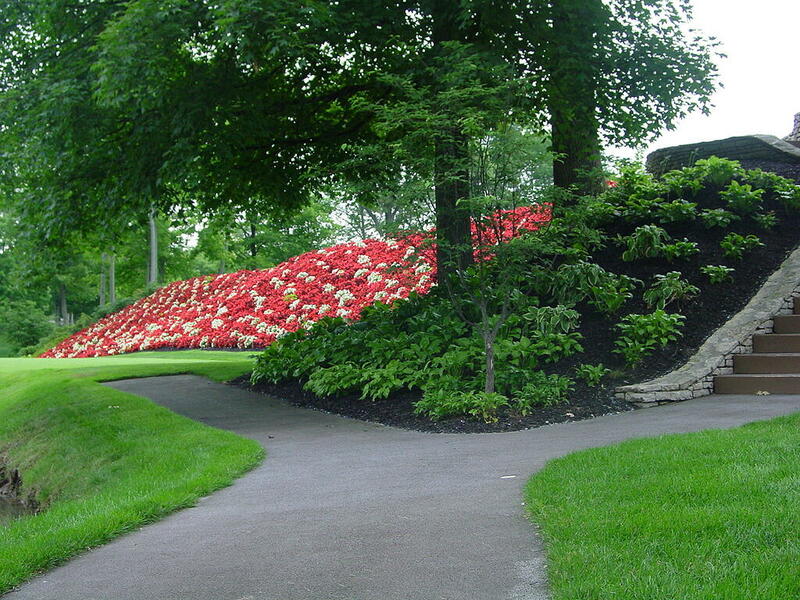 It all started when the Director of Grounds Operations at Muirfield Village Golf Club, gave Tim left over Holganix Golf (a Bio 800+ product) to utilize in his two, 3,000 square foot green houses. 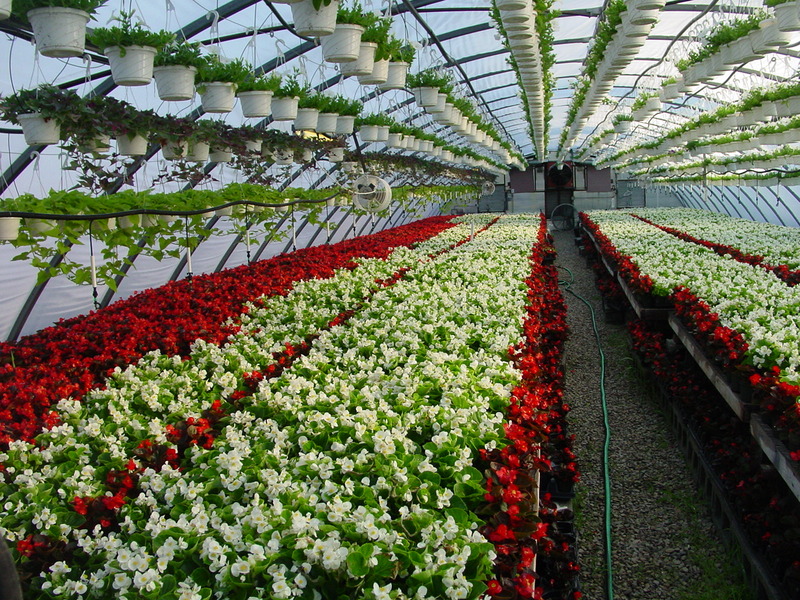 The green houses contain some 2,200 hanging baskets and 9,000 plants. Tim then planted the shrubs, watered them in and mulched. In another instance, Tim treated annuals with Holganix Golf. After 30 days, Tim removed the annuals from their pots and examined the roots. White, web like mesh was growing around the roots. Being the horticulturist at Muirfield is not for the average mortal! Being the Horticulturist at Muirfield Village Golf Club is no picnic. “It’s not for the average mortal man,” admits Tim. During tournaments, Tim and up to eight other team members will work up to 100 hours a week in order to get plants camera-ready for the Memorial Tournament. When spring hits, Tim has two months to get the plants in mid-season conditions. Tim was inspired by his grandmother to pursue a career in plant and turf care. He speaks fondly of memories tending to the garden with her in his youth. “She had a tiny piece of property,” says Tim. If he helped garden, his reward would be a delicious tomato sandwich straight from her garden. Playing gardener inspired Tim to attend a Vocational Technical High School for agricultural business. In college, he earned an A.S. turf grass management and earned a B.S. in agriculture and forestry. After a few years as an assistant superintendent and then a superintendent (he earned his Certified Golf Course Superintendent status) he moved into the horticulture end of golf course management. That’s when Tim became the horticulturist at Muirfield Village Golf Club where he’s spent the last 9 years of his career. How does Tim use Holganix products? 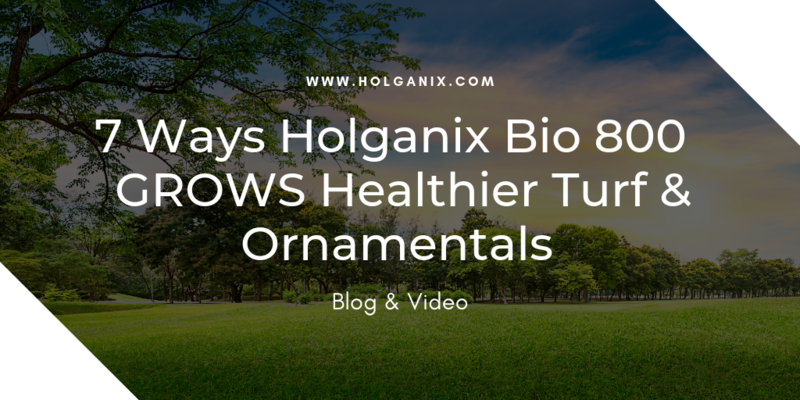 After his initial experiences with Holganix products, Tim started utilizing Holganix Tree and Shrub on his plants and annuals (he’ll be incorporating Holganix Bloom on his flowering plants later this year). At the start of the season, he used Holganix Tree and Shrub on and off as he continued to test. However, it didn’t take long until he started applying it every month on all plant beds. So far, he’s applied Holganix to the beds at a 10oz rate each month from Mid March to October 1. “Along with Holganix Tree & Shrub, I’ve been applying .175 pounds per 1,000 square feet of nitrogen per monthly application,” says Tim of his current program. Because Holganix Tree & Shrub promotes optimal plant health, it has also helped Tim produce healthier and stronger plants that see less pest and stress issues. With Holganix Tree & Shrub, he reports that the plant is green and the leaves are expanding. "We have never used a product like Holganix Tree & Shrub!" Muirfield Village Golf Club has used compost tea, yeast, and mycorrhizae in the past, but “We have never used a product like Holganix Tree & Shrub,” says Tim.